Gearheads of all ages will experience the true excitement of professional truck pulling with Shootout Productions motorsport competition. “Gear Heads” will get a special treat with the SPI Professional Truck Pulling Series by Shootout Productions, Inc. featured for the first time this year at the Columbia County Fair. Pulling starts at 6 p.m. on Aug. 31 and features four classes: Limited Pro Stock Diesel, 2.5 Workstock Diesel, Enhanced Gas , 4WD Modified and 8500 lb Street Outlaw. The Street Outlaw class is designed for daily driven, on the road pickup trucks (full bodied pickup truck). The vehicle may be two or four-wheel drive. Registration and entry fee will be handled by Shootout Productions starting at noon on Aug. 31 from a special registration trailer set up at the fairgrounds. Entrants should plan to register their trucks that afternoon at the fairgrounds and applications will be taken that afternoon right up until show time. Any contestant under age 18 must have written consent from a parent or guardian. Minimum age for competing is 16 years old. Full entry rules may be found at www.columbiafair.com. Productions, Inc. has grown from producing one event in Massachusetts to more than 10 events all over New England and New York. 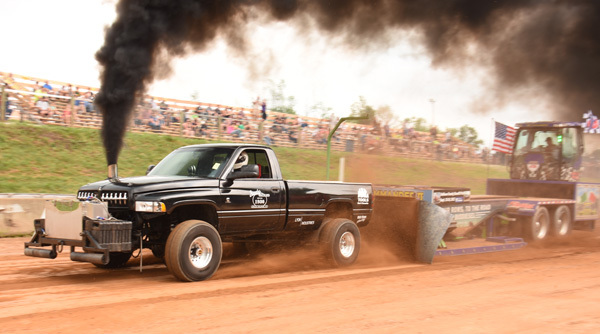 “Shootout Productions has a history and passion for truck pulling. It runs through their blood,” said John Craft, fair entertainment director. “We want fairgoers to experience the true excitement of the sport,” he said. “Who will be the 2018 ‘Street Outlaw?’” The motorsport competition is co-sponsored by ACP Power Equipment Inc. and Broadway Garage. This year’s 178th annual fair opens Aug. 29 and runs through Labor Day, Sept. 3 daily from 10 a.m. to 11 p.m., except for opening day when the gates swing open at noon. Amusements of America will offer 30 amusement rides this year, including many for younger children. All-day ride passes will be offered each day. Children ages 12 and under continue to get in free daily. Active military personnel with ID or in uniform are also admitted free. On Thursday, Aug. 30 from 10 a.m. to 4 p.m., senior citizens age 62 and older will be admitted for $5 and youth ages 18 and under will be admitted free. Parking for the entire six-day fair run is free.